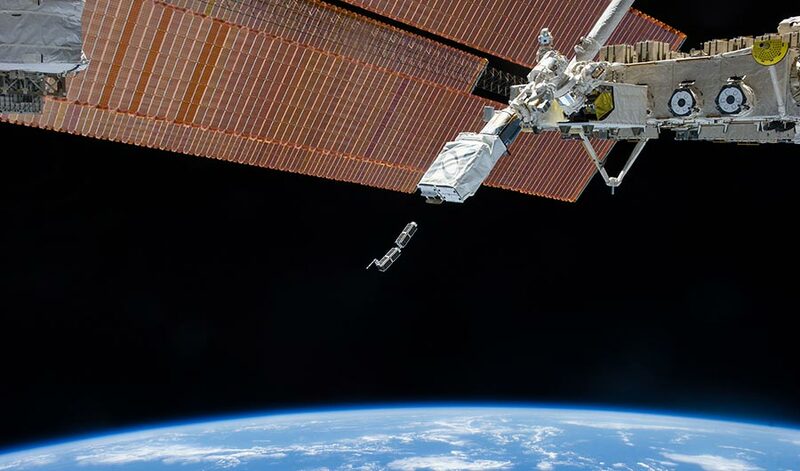 Image from Feb. 11, 2014, of CubeSats deployed from International Space Station. The proposed GOAT telescope would assemble itself from thousands of robots launched into space in similarly sized packages. (Inside Science) -- The most powerful space telescopes are usually large satellites that are expensive to build and launch. Now researchers suggest fleets of breadloaf-sized robots could help construct giant space telescopes larger than any previously set in orbit. This strategy could also help build giant power stations in space and asteroid mines, researchers said. Like many applications, bigger is often better in space -- the larger a space telescope is, the more light it can gather, helping it capture higher-resolution images and spot fainter objects. However, the size of space telescopes is limited by the capabilities of the rockets or space shuttles that carry them into space. Telescopes that capture visible and infrared light typically require mirrors, and developing foldable mirrors for these wavelengths is complex when it is even possible at all. One alternative is to launch all the parts of a large spacecraft into space and then assemble them in orbit. Now scientists in England are proposing that robotic modules could assemble themselves into a Giant Orbiting Astronomical Telescope (GOAT) more than 100 metric tons large. The design possesses two ring-shaped mirrors that work in conjunction to act like a single mirror 25 meters wide for collecting visible and near-infrared light. In comparison, the Hubble Space Telescope's primary mirror is 2.4 meters wide, while the upcoming James Webb Space Telescope will have a primary mirror 6.5 meters wide. GOAT could potentially resolve features a mere 10 to 20 kilometers across on Jupiter and 200 kilometers across on objects as far as Pluto. Similar platforms could even observe Earth, "enabling real-time detailed persistent observation," said Craig Underwood, head of the planetary environments group at the Surrey Space Center. The researchers envision that GOAT would orbit at roughly 35,800 kilometers. This would make it close enough for access to potential repair, upgrade and refueling missions. One strategy for building GOAT would use a central satellite with a robotic arm to assemble the mirror pieces together. Another would use "smart" mirror segments, each capable of flying on their own to assemble around the central satellite. The researchers noted that the second strategy might be wasteful, since each mirror segment would spend most of its life as part of a bigger assembly instead of as individual autonomous spacecraft. However, they added that because smart elements are more independent, launches of them could be unfurled over time to spread out costs. Ultimately, they suggest constructing GOAT might incorporate a combination of these approaches. If each mirror segment of GOAT is an autonomous hexagonal spacecraft 10 centimeters wide and 6 kilograms in mass -- about the size of CubeSats now regularly deployed in orbit -- the researchers envision about 14,000 segments are needed. A central hub satellite is also needed, as are several mobile "helper satellites" to assemble elements such as trusses that would hold everything together. Altogether, GOAT would have a mass of roughly 112 metric tons, requiring 17 launches with United Launch Alliance Delta-IV Heavy rocket, with launch costs alone reaching about $5 billion. However, the scientists do note SpaceX's Falcon Heavy rocket might cut launch costs by two-thirds. Many research teams have previously suggested assembling large space telescopes from smaller modules, with examples ranging from 30 to 100 meters in diameter. A virtue of this new concept compared to prior efforts is that there is a project in the works to test it, said Sergio Pellegrino, a senior research scientist at NASA's Jet Propulsion Laboratory in Pasadena, Calif. The AAReST (Autonomous Assembly of a Reconfigurable Space Telescope) mission will test some of autonomous rendezvous and docking maneuvers and optical technologies needed for a future modular satellite. AAReST possesses two mirror segments that can detach from the spacecraft and use butane thrusters to maneuver themselves into new positions on the satellite. Infrared laser scanners on the segments will help them navigate, and electromagnetic clamps will help them dock. The final version of the AAReST spacecraft is currently under development from the University of Surrey, the California Institute of Technology and the Indian Institute of Space Science and Technology, and is due for completion in December. "We expect a launch sometime in 2019," Underwood said. There have been other, perhaps even wilder, alternatives for building spacecraft in orbit. For instance, they could use 3-D-printers to manufacture satellite parts directly in space that could be then assembled together. However, Pellegrino noted that manufacturing space telescope quality mirrors and lenses requires nanometer-level precision, whereas "the highest accuracy currently achievable with 3-D printing is on the order of 10 micrometers. We should work on further developing in-space manufacturing, but in my opinion, we should start by building structures a lot easier than an optical telescope." Constellations of satellites flying in formation can also behave as big virtual telescopes. However, "in our view, this is very challenging, due to the ultimate in precision formation control needed," Underwood said. There are many potential applications for autonomous orbital rendezvous and assembly besides space telescopes. "Orbital robotics and AI techniques in general can enable future spacecraft to repair satellites, remove space junk, extract resources from asteroids and comets, and so on," said study co-author Yang Gao, a space roboticist at the University of Surrey in England. Another possibility is a satellite that collects solar power in orbit and beams energy down to Earth, Pellegrino said. Modular satellites may be key to the future of space. "NASA is now looking at in-space assembly for telescope studies beyond the James Webb Space Telescope," Pellegrino said. Gao and her colleagues detailed their findings in the December issue of the journal Acta Astronautica.